Jean-Jacques Dessalines (Haitian Creole: Janjak Desalin) (20 September 1758 – 17 October 1806) was a leader of the Haitian Revolution and the first ruler of an independent Haiti under the 1801 constitution. He was autocratic in his rule and crowned himself Emperor of Haïti in 1805. Beginning as Governor-General, Dessalines later named himself Emperor Jacques I of Haiti (1804–1806). He is remembered as one of the founding fathers of Haiti. Dessalines served as an officer in the French army when the colony was trying to withstand Spanish and British incursions. Later he rose to become a commander in the revolt against France. As Toussaint L'Ouverture's principal lieutenant, he led many successful engagements, such as the Battle of Crête-à-Pierrot. After the betrayal and capture of Toussaint Louverture in 1802, Dessalines became the leader of the revolution. He defeated French troops sent by Napoleon at the Battle of Vertières in 1803. 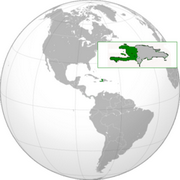 Declaring Haiti an independent nation in 1804, Dessalines was chosen by a council of generals (blacks and mulattos) to assume the office of Governor-General. In September 1804, he proclaimed himself Emperor and ruled in that capacity until being assassinated in 1806.